University of Portland’s Christus Magister Medal is awarded annually to men and women of international distinction. Those to whom the award is presented have evinced a vigorous spiritual life and an accomplished professional career that has significantly advanced knowledge, been of inimitable service to his or her fellow men and women, and been an inspiration and consolation to the world. 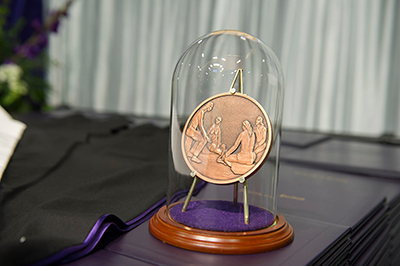 The Christus Magister Medal is the University’s highest honor, conferred upon those men and women whose lives have illustrated and enhanced the University’s mission, now more than a century old.